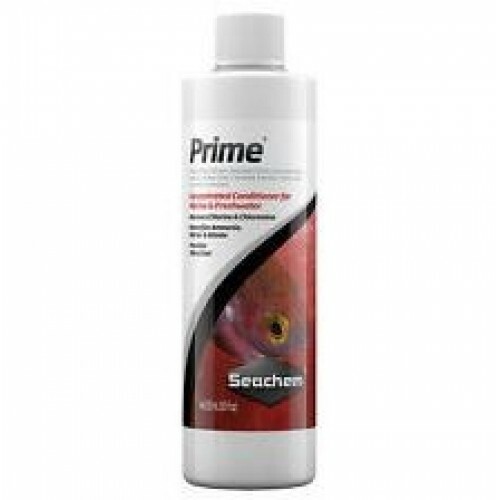 Prime® is the complete and concentrated conditioner for both fresh and salt water. Prime® removes chlorine, chloramine and ammonia. Prime® converts ammonia into a safe, non-toxic form that is readily removed by the tank’s bio filter. Prime® may be used during tank cycling to alleviate ammonia/nitrite toxicity. Prime® detoxifies nitrite and nitrate, allowing the bio filter to more efficiently remove them. It will also detoxify any heavy metals found in the tap water at typical concentration levels. Prime® also promotes the production and regeneration of the natural slime coat. Prime® is non-acidic and will not impact pH. Prime® will not over activate skimmers. Use at start-up and whenever adding or replacing water. Nearly all companies manufacture a product that removes chlorine. None of those, however, can compare in quality, concentration, or effectiveness to Seachem’s flagship product: Prime®. Prime® is the second most concentrated dechlorinator on the market after our own aquavitro alpha™. A single 100 mL bottle will treat 1000 US gallons of tap water. Prime® will remove both chlorine and chloramines from municipal water supplies. Prime® also contains a binder which renders ammonia, nitrite, and nitrate non-toxic. It is very important to understand how those two functions work together. All dechlorinators operate through a chemical process known as reduction. In this process, toxic dissolved chlorine gas (Cl2) is converted into non-toxic chloride ions (Cl-). The reduction process also breaks the bonds between chlorine and nitrogen atoms in the chloramine molecule (NH2Cl), freeing the chlorine atoms and replacing them with hydrogen (H) to create ammonia (NH3). Typically, dechlorinators stop there, leaving an aquarium full of toxic ammonia! Seachem takes the necessary next step by including an ammonia binder to detoxify the ammonia produced in the reduction process. Be very careful when purchasing water conditioners. If your municipality includes chloramines in the water supplies, a standard sodium thiosulfate dechlorinator is not enough. Prime® promotes the natural production and restoration of the slime coat rather than relying on artificial or non-native slime compounds. A further bonus for the reef hobbyist—Prime® will not over activate protein skimmers. Use 1 capful (5 mL) for each 200 L (50 gallons*) of new water. This removes approximately 1 mg/L ammonia, 4 mg/L chloramine, or 5 mg/L chlorine. For smaller doses, please note each cap thread is approx. 1 mL. Prime® may be added to aquarium directly, but better if added to new water first. If adding directly to aquarium, base dose on aquarium volume. Sulfur odor is normal. For exceptionally high chloramine concentrations, a double dose may be used safely. To detoxify nitrite in an emergency, up to 5 times normal dose may be used. If temperature is > 30 °C (86 °F) and chlorine or ammonia levels are low, use a half dose.